WordPress is one of the most popular open source content management systems today, used by more than 30% of all websites to host online web applications. WordPress is written in PHP, and both PHP and WordPress can run on NGINX Unit, the new dynamic application server from NGINX, Inc. Formerly, deploying WordPress with NGINX required the use of a separate application server, such as Apache or PHP‑FPM. NGINX Unit is more flexible, supporting Go, Perl, Python, and Ruby along with PHP. 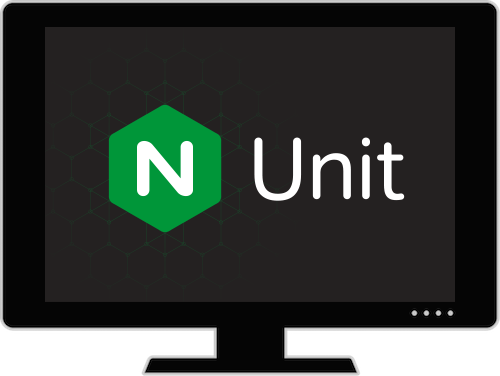 With NGINX Unit, you set up and make changes to your application server dynamically – without service disruption or configuration reloads – using the RESTful JSON API. This makes hands‑on management easier, and also makes it much easier to automate some or all of your management tasks. In this blog post, we describe how to set up WordPress on a “LEMU” stack (Linux, NGINX Open Source, MySQL or MariaDB, and NGINX Unit) on a host running Ubuntu 16.04. The instructions are written from the bottom up. First, we describe the architecture. Then, we show how to install the database, application language, application server, and finally, the web server and load balancer. This way, you can validate every step of your installation, simplifying troubleshooting in case of errors. WordPress is a fairly standard three‑tier web application. It includes PHP scripts that have to be executed by a PHP processor and static files that have to be delivered by a web server. Direct URLs. For users who request a PHP file directly (for example, with GET /wp-admin/admin.php), an application server needs to open the required PHP file and process it. User‑friendly URLs. Most WordPress admins prefer to have meaningful URLs such as /blog, /products/software, or /store instead of /index.php?p=123, /index.php?p=234, or /index.php?p=4567. WordPress does not create user‑friendly files and folders in the filesystem. Instead, it expects a web server or an application server to send all requests for unknown files to /index.php. With NGINX Open Source and NGINX Unit, the two URL schemes are configured as two separate applications, running at separate locations. One of the key required components of a fresh WordPress installation is a database to store user accounts and site data. 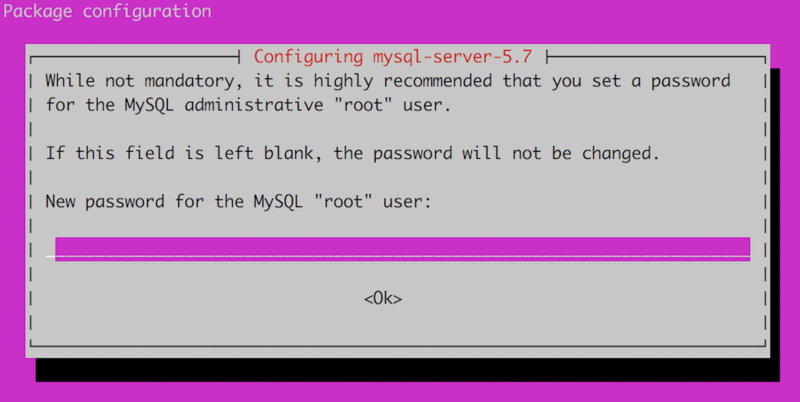 In this blog post, we’re using MySQL. Note: For a detailed description of each action, see the MySQL documentation about secure installation. Now that MySQL is installed, we create a database to store the WordPress content and a user account that has permission to manage the database. The values in orange are examples we’re using in this blog; substitute the values appropriate to your deployment. In this blog, we’re preparing the WordPress installation in a temporary directory, and later moving the files to the document root. As a quick and simple way to configure WordPress, we start with a copy of the sample configuration file provided by WordPress and make a few modifications. To strengthen security, use the WordPress salt function to randomly generate new secret keys. Changing out the keys allows the administrator to force all users to log in again. The output is similar to the following; in Step 4 you’ll copy values from the output into wp-config.php. 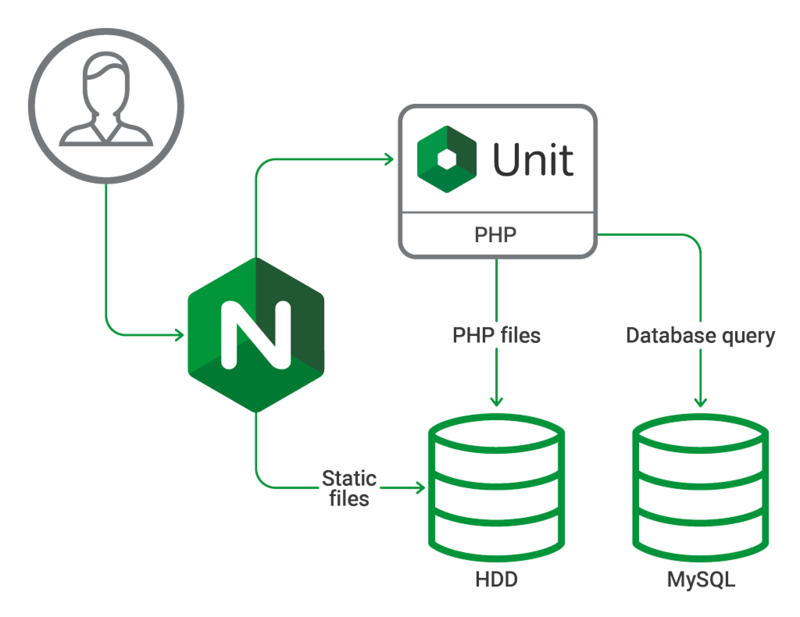 We recommend that you install PHP and relevant extensions prior to installing NGINX Unit. For WordPress, you need several extensions that are not in NGINX Unit’s list of dependencies. When you install a prebuilt NGINX Unit package as instructed in the next section, the package manager downloads the correct dependencies. For Ubuntu 16.04, the dependencies are based on PHP 7.0, but for older systems, such as ones based on CentOS 7.0, the dependencies include PHP 5.4. Install the precompiled NGINX Unit package for your operating system, following the instructions in the NGINX Unit documentation. If the phpinfo page appears, Unit was installed correctly. If not, see the Unit Troubleshooting Guide. The following instructions create a file of JSON‑formatted configuration for WordPress and use the NGINX Unit API to load it into NGINX Unit. This instantaneously updates the initial NGINX Unit test configuration we loaded in Step 3 of the previous section. This configuration creates two NGINX Unit applications, one for each URL scheme – the web application and the administration panel. Using the NGINX Unit script parameter instead of the index parameter means that requests for pages that are not found use the main index.php script in WordPress. 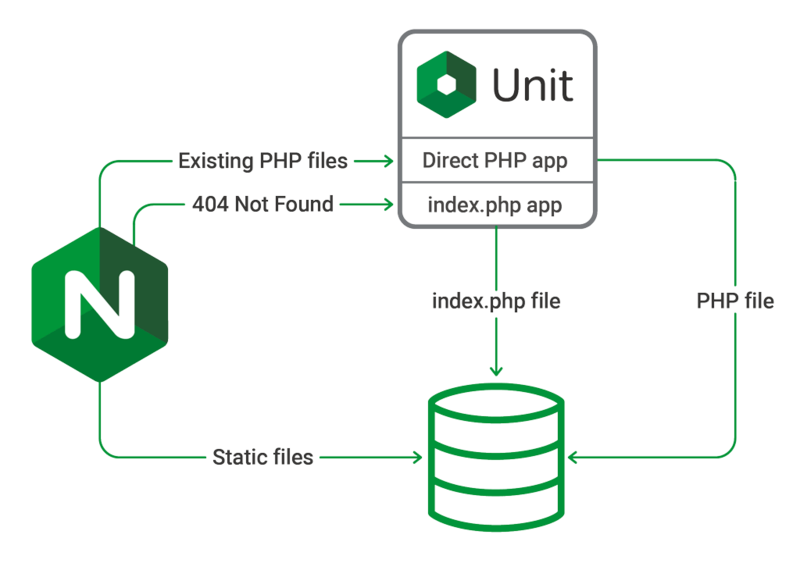 For more information, see the NGINX Unit documentation for PHP application objects. To scale your application, change the IP addresses and ports accordingly. We recommend installing NGINX Open Source as a prebuilt package from the mainline branch in our official repository. The packages available from other sources (operating system vendors, for example) are often several releases behind. You can also build NGINX Open Source from source. For large‑scale and production WordPress deployments, NGINX Plus includes enhanced capabilities that improve site performance and make management easier. You can try it for free for 30 days. See Enhanced Capabilities in NGINX Plus for more information. In a browser, navigate to the IP address or hostname of the NGINX host. The appearance of this page confirms that NGINX is running. You can also run the following command on the NGINX host and confirm that the raw HTML code for the page appears in the terminal. If the curl command works, but browser access does not, check your routing configuration, firewalls, and any network settings that affect traffic between the NGINX host and your client machine. Now we configure NGINX Open Source to support both of the URL schemes described in Architecture Overview, by defining location blocks that forward traffic to our two NGINX Unit application servers as appropriate. The first location block handles requests for the root URL (/). The try_files directive searches for the exact URI. If it doesn’t exist, the request is sent to the second, named location @index_php, which proxies it to the index_php_upstream upstream group. The third location block handles requests for /wp-admin and serves the index.php file directly. This location does not need to handle URLs that aren’t found. The last location block handles requests for the .php extension, which match the regular expression. It proxies the requests to the index_php_upstream upstream group, where the generic NGINX Unit application handles all PHP requests directly. The try_files directive handles 404 errors by displaying a page generated directly by NGINX. Another option is to let WordPress handle 404 errors, by replacing =404 with @index_php. For security purposes, or for segregating traffic further, you can include additional location blocks and different parameters to the try_files directive. You’re all set! 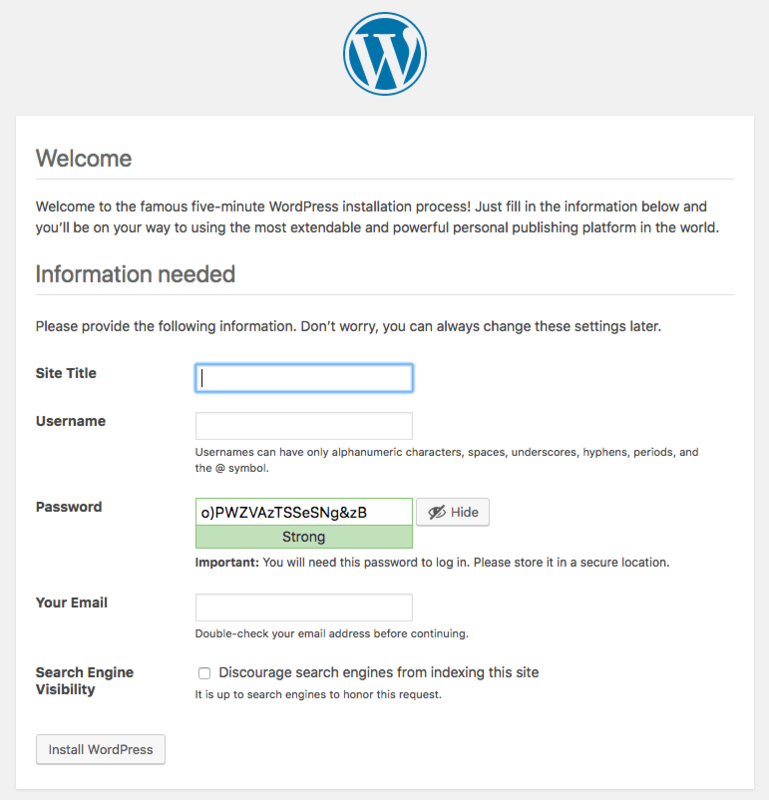 You now have WordPress up and running in a “LEMU” stack with NGINX and NGINX Unit. To get the most out of your WordPress application, we recommend NGINX Plus for its enhanced features, such as application health checks, sophisticated caching of both static and dynamic content, and live activity monitoring. These features are especially beneficial if you have multiple WordPress servers and require load balancing. And they work well with NGINX Unit; the image below shows the live activity monitoring dashboard on an NGINX Plus instance that is load balancing three NGINX Unit servers. For details about all the great features in NGINX Plus, see the product page. To try it in your WordPress environment, start your free 30-day trial today or contact us.